Zhi Lin, Chinaman’s Chance on Promontory Summit: Golden Spike Celebration, 12:30 PM, 10th May 1869, 2015, HD video projection on painting (charcoal/oil on canvas). Courtesy of the artist and Koplin Del Rio Gallery, Culver City, CA. Margarita Cabrera in collaboration with Flor Garcia, Ana Patricia, Magda Vazques, Rocio Magdaleno, Nardaf Aponte, Cecilia Magdaleno, Maria Argentina Reyes, Yanira Gonzalez, Magdalena Morales, Caritina Vega, Liliana Mendez, Jessica Hernandez, Dalia Gonzalez, Manuel Hernandez, Aleyda Gallimore, Lucre Suarez and Ada Bella, Space in Between – Nopal #5, 2012, Border patrol uniform fabric, copper wire, thread, terra cotta pot, Courtesy of the artists. Treacherous voyages across land and water, crowded conditions in trucks or boats, border officials, detention centers, extreme fatigue, and even death: There is much specific and intense imagery that we can associate with the story of immigration to America. During a visit to the Asia Society’s current exhibition, The Other Side: Chinese and Mexican Immigration to America however, you will be hard-pressed to find many representations of these scenes. Instead, works by six contemporary artists creatively embody the hardships and messages of exclusion that Chinese and Mexicans immigrants have experienced since the beginning of their migration to the United States. On view at Asia Society Texas through July 19, The Other Side features paintings, drawings, video, and sculptural installations which collectively explore the persistent issues of immigration that continue to trouble not only Mexican- and Chinese-Americans, but hundreds of other national groups who have traveled into the United States to forge a new life. 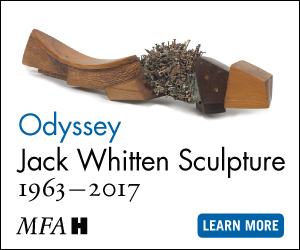 Like parallel stories told in alternating chapters, the histories of these two groups are intertwined throughout the exhibition space. Much of the work about Chinese-Americans seeks to reclaim this group’s place in history as tenacious pioneers and railroad workers in the history of the American West. In Hung Liu’s paintings, the artist depicts two Chinese women who came to America during the rush of immigration during the late 1800s. Bright and colorful, a short series of pop-inspired portraits done by Liu profiles Polly Bemis and “China Mary.” While their busts are rendered in a brushy, painterly style, these portraits also feature flat, floating symbols such as birds and flowers. Bubble-like circles featured in the works lend a sense of whimsy, while the lines on the women’s faces and lines of dripping paint give the impression of hard work, mystery, and the passage of time. Zhi Lin’s multimedia installation Chinaman’s Chance re-enacts the 1869 Golden Spike Ceremony, which linked the First Transcontinental Railroad in Promontory Summit, Utah. 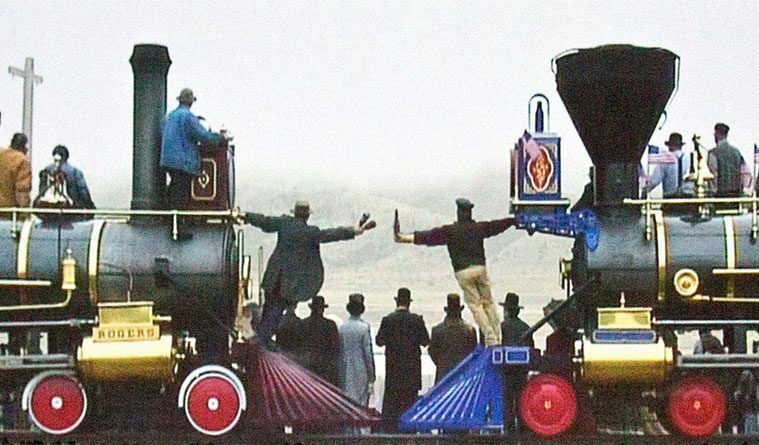 Despite the fact that approximately 23,000 Chinese immigrants helped to build this railroad, the group was excluded from the ceremony’s proceedings and pictures. Lin’s re-enactment video is shot from the point of view of the Chinese workers, who watch the ceremony from behind the trains and platform. This video is projected onto a canvas that features eerily-still native grass painted into its foreground. Together with the trains, the grass reinforces the seemingly immovable barrier between the Chinese workers and the ceremony, while the work itself provides an opportunity for audience members to access the railroad’s complete history. The transcontinental railroad is also featured in Hung Liu’s Jiu Jin Shan (Old Gold Mountain), a sculptural installation in which several yards of railroad track are nestled into a large pile of crisp, golden fortune cookies. Arranged in a cushioning layer below the tracks and a peaked pile on top, these sweets (despite their hopeful glow) are in fact empty of their characteristic fortunes. The cookies’ temporal delicacy is palpable and the sculpture itself serves as a monument to the many Chinese immigrants who gave their lives for work which, only recently, they received appropriate recognition. 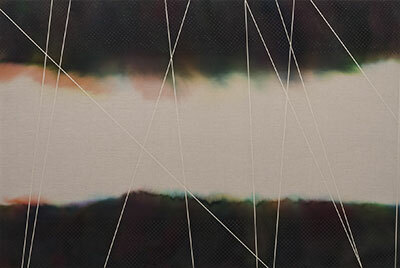 Tony de los Reyes, Border Theory (indeterminate zone/black), 2013, Dye and oil on linen. Courtesy of the artist. Rather than addressing history through abstraction, works that represent the experiences of Mexican immigrants in The Other Side commonly feature a real, physical motif: the border. The first work in the exhibition, No Olvidado (Not Forgotten), no. 10 by Andrea Bowers, is one of many ceiling-high panels that list names of those who perished in the effort to cross the U.S.-Mexico border. Up and down, left and right—these names have been delicately incorporated into a drawing of a chain-link fence, held in ghostly permanence between Mexico and the U.S., this world and the next. In Bower’s never-ending series, the lives and dreams of these individuals are not forgotten. Margarita Cabrera’s cloth sculptures of cacti also embody barriers. Made out of Border Patrol uniforms and sewed by people who had crossed the border, these sculptures intimidate, despite their soft medium. 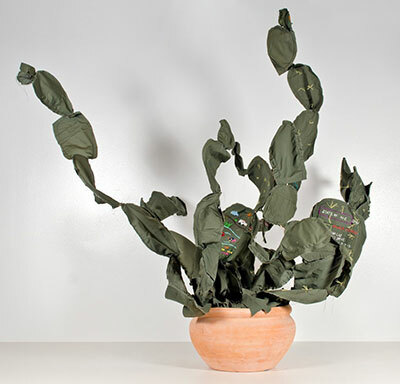 The cacti’s green bodies feature the remains of Border Patrol patches as well as hand-stitched pictures of plants and animals, skulls, and river-crossings to ambiguously merge the two opposing sides of this shared crossing experience. 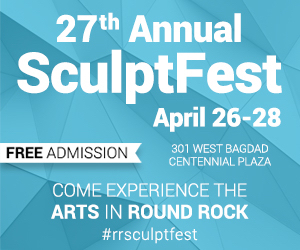 Borders appears again in Blane De St. Croix’s sculptures Two Ends—small-scale replicas of the end of the U.S.-Mexico borders in Texas and California—and in his drawing series US/Mexico Border. In the latter, eight drawings, shown in sequence like pictures from a photo booth, represent a multi-faceted and omnipresent border. In some drawings, the border fence is towering in the foreground, while in others, it only peeks out between rolling hills in the background. As with De St. Croix’s drawings, The Other Side reminds us that issues with immigration and naturalization run the course of U.S. history. Even when it is not visible, the United States border, and the issues that come with it, has a real presence in the lives and minds of the people who live on both sides of it.